Kodiak Canvas 8.5 x 6 ft Flex Bow 2 Person VX Tent 6086 is a 4-season waterproof but breathable cotton tent with a steel frame, two doors, and four windows. Kodiak Canvas VX Flex Box Tent 6086 8.5 x 6 ft.
Metal loops for staking the tent. Check on Amazon, they have the best prices and shipping conditions with their stores on several continents. This 8.5 x 6 ft Flex Bow 2 Person VX Tent is the newest and the smallest cabin-style tent of this brand. They are famous for their canvas camping tents that are in the range 4 – 8 people and all with a stand-up height. But this 2-person tent is lower, with a peak height of 4 ft (122 cm). However, the letters VX indicate that this is a tent from their new VX series which offers more features than their other series. If you are not familiar with this brand, they have the Basic, Deluxe, and Super Deluxe or VX series. The summary of the differences and similarities of these series are given in this text where you have examples of all of them side by side so please have a look. This is a top-quality and rugged tent with a steel frame, designed to withstand the harshest conditions. Note that this is a non-freestanding tent which must be staked down firmly in order to be self-supporting and stable. So it is necessary to choose a proper ground which will keep the stakes in place. The term Flex Bow implies that you have tensioned steel rods in the roof structure, one of them is visible in the picture below, but you will see more about this below. The numbers 8.6 x 6 indicate the floor dimensions in feet. I have no idea what the numbers 6086 might mean. The side view showing the window and one of the two leg poles. This is also a unique model on the market. I do not remember seeing anything similar to it. The capacity: The declared capacity is 2 people, so let’s see what it offers. 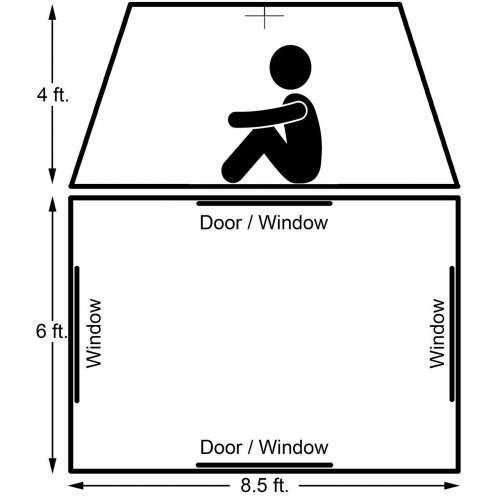 The floor area is 51 ft² (4.7 m²) and this means 25.5 ft² (2.35 m²) per person. So this is a generous space for two campers. The picture below shows its most important dimensions so you can get some idea of how to organize the space in such a tent. The most important dimensions and the floor plan. Note that there are no vestibules or porches here, so you have to keep your stuff inside or in the car. The weight: Being a canvas tent with a steel frame, this is a heavy structure. So the total weight is 30.5 lb (13.8 kg). Obviously, this is a car camping tent and you are not supposed to carry it long distances. The packed size: It is quite compact when you compare it with other Kodiak Canvas tents, it packs to 30 x 10 inches (75 x 25 cm). This is compact enough even for motorbikes and for horse raiding. Seasons-wise and climate-wise, this is a 4-season camping tent and it will perform great in any climate. Kodiak Canvas tents have been on the market for many years already, tried and tested in all seasons. They are very reliable and this tent here is no exception. You have 10 stakes included, the legs poles are kept in place with a pin system plus strong vertical sleeves on the side. The structure is incredibly strong once you stake it down properly, so it will withstand lots of pressure from any side. This tent can be used for winter camping but they suggest avoiding heavy snow accumulations on the roof. When compared with synthetic, canvas has better insulation properties. On the other hand, this is a breathable material so condensation, although unavoidable, should be less present here than in any synthetic tent. Being breathable, it will also perform great in a warm climate because the canvas creates a cooler atmosphere in the tent. Note that this tent is without guylines, so all the job for keeping it in place is on the stakes and the stake loops. But note that the stakes are long and the stake loops are not webbing, you have steel loops instead. The tent is relatively low and this together with the mentioned features makes it stable in strong winds. What you see above are 1 inch (2.5 cm) thick galvanized steel legs and the ridge poles. You have only 2 legs so from this you realize that it is essential to stake the tent firmly to the ground in order to be stable and self-supporting. 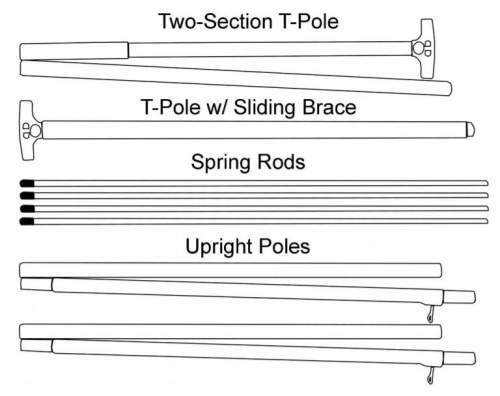 The ridge poles have 3 components, two are T-poles plus one sliding brace (a steel tube) that overlaps the connection between the two T-poles. You have pop-up spring buttons that lock this overlapping tube in place, so the roof ridge structure is unbreakable. There are 4 flex-bow steel rods and they are 7 mm in the diameter, so this is a solid spring steel which gives tension to the roof. The stakes are 12 inches (30 cm) steel. The two legs are telescopic by the design so you just extend them and fix into the desired length with the screws (no tool required). The tent material is the Hydra-Shield 100% cotton duck canvas, very durable, watertight and breathable. The roof is 10 oz and the walls are a bit thinner 8.5 oz. This is a single-layer design as usual with canvas tents, but all the openings are mesh plus canvas. The floor is bathtub style and here you have durable 13.5 oz vinyl with polyester reinforcement. 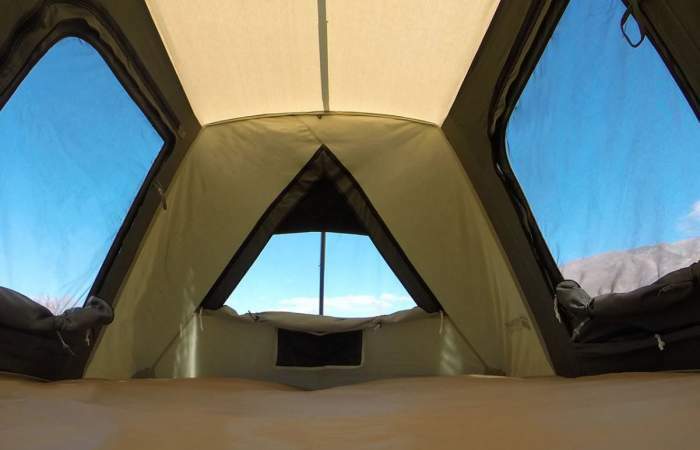 This tent has two triangular windows on the sides, so this is a trademark of the VX series, you do not have them in other Kodiak tents. You have mesh from outside and waterproof canvas panels from inside. The panels can be rolled and fixed to the wall under the windows you have toggles and loops for this purpose, this is visible in the picture below. You can unzip them up to any level and regulate ventilation and privacy. View inside, two doors on the sides and one of the triangular windows in the middle. Very wide flaps (around 3 inches wide) protect the zippers on all the openings. There are two identical doors, front and rear, both D-shaped and with dual mesh/canvas structure, you can see them above with mesh. This is a canvas material so it is breathable. You have huge openings with mesh on all four sides. But when it is raining you have to keep the panels closed. In such situations the triangular side windows can be unzipped from the top, there is a flap on their upper sections that cover their top area, so when you unzip them from the top you have vents created and the protection is still complete. Kodiak Canvas tents are highly praised for their reliability, so they do not leak but this may happen. A new tent needs seasoning, so spray it thoroughly at home and let it dry completely. In the case of leaking, they suggest using silicone-based sprays like the Kiwi Camp Dry. They do not recommend using other types of waterproofing sprays as they may affect the breathability of the canvas. You have #10 YKK zippers, the best on the market. Under each of the triangular windows you have hanging mesh pockets to store your small items. There are webbing loops under the ceiling so you can pass a cord to hang your stuff or attach a lamp. 1 T-pole with a sliding brace. 4 spring rods for the roof. This is a cotton canvas so it is essential that it is stored completely dry. They suggest not using any insecticides or bug repellant on the canvas as this may affect the water-repellent treatment. Do not use soaps and detergents to clean, for the same reasons as above. The weight is mentioned here more as a fact to bear in mind than as an objection. This is a car camping tent and built from very strong and durable materials, and you are not supposed to carry it in any case. While other VX tents have a footprint included, you do not have it here. Pity. Total weight: 30.5 lb (13.8 kg). – Tent: 15.5 lb (7 kg). – Poles 10.5 lb (4.8). – Stakes: 4.5 lb (2 kg). Dimensions: 8.5 x 6 ft (259 x 183 cm). Area: 51 ft² (4.7 m²). Area per person: 25.5 ft² (2.35 m²). 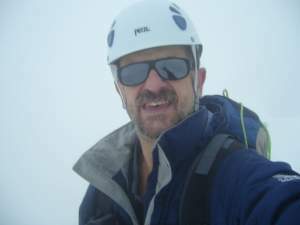 Peak height: 4 ft (122 cm). Packed size (L x D): 30 x 10 in (75 x 25 cm). 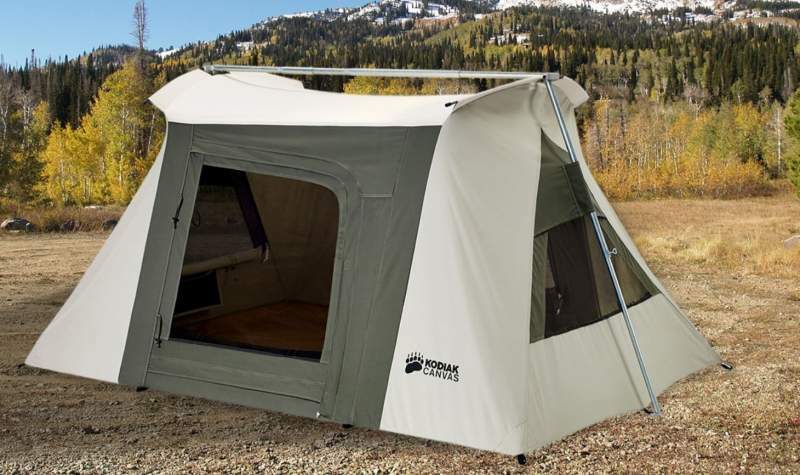 As you realize, this Kodiak Canvas 8.5 x 6 ft Flex Bow 2 Person VX Tent 6086 is incredibly well built and reliable. The craftsmanship is at the highest level, and the materials are top quality and durable. The price is to match, so this is an expensive tent but worth the money. I can fully recommend it. You might want to know that they also have a solo canvas tent, the Kodiak Canvas Swag 1 Person Tent, but this is a completely different construction which you can also use on a large cot as a tent-cot system. If you need more options from this size range, please check my list with best two person tents for camping, this Kodiak tent is also included there. Note that I am not paid by the brand or related in any sense, so this is NOT a sponsored text. I only give my unbiased view of the tent. Thank you for reading. 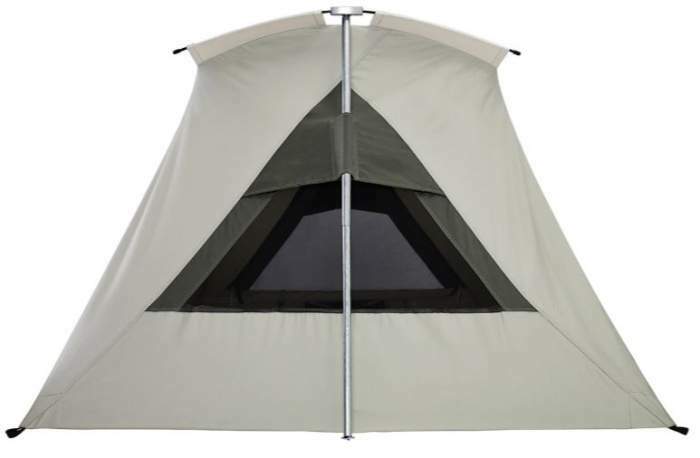 Please let us know if you have any experience with this tent, there is a comment box below. I wish you a nice day.